The villa is located on the Boulevard Corniche d'Or and is divided into 3 apartments with a very luxurious finishing level, including marble flooring, Panel doors, air conditioning etc etc. On the 1st floor is situated a cosy apartment (85 m 2) with a spacious living room and open kitchen of solid oak with luxury built-in appliances. To the dining table oak 6 persons enjoy a fantastic view over the Bay of Cannes. The living room is attractively furnished with leather sofa bed suitable for 2 Pax, fauteuills, Oak coffee table, oak furniture with flatscreen tv and dvd player. The 2 bedrooms have adjoining a bathroom and a separate toilet. Exclusively for this apartment is in the garden a large sun terrace and 8 seater dining table at your disposal with a beautiful view on the marinas and Cannes. In the larger apartment (100 m2) on the 2nd floor which features the same facilities you run through doors to around a cosy balcony and the delicious outdoor terrace. The apartment on the 3rd floor (50 m 2) has a living room/kitchen and bedroom/bathroom. The living room also features a French oak kitchen and the bedroom on a sofa bed for 2 persons. In the bedroom is a double bed, a bath and a double washbasin furniture. It is also here the separate toilet. Adjacent are a big terrace with porch and large dining table with enough space for sunbathing and cosy with the whole family or group of friends to enjoy. 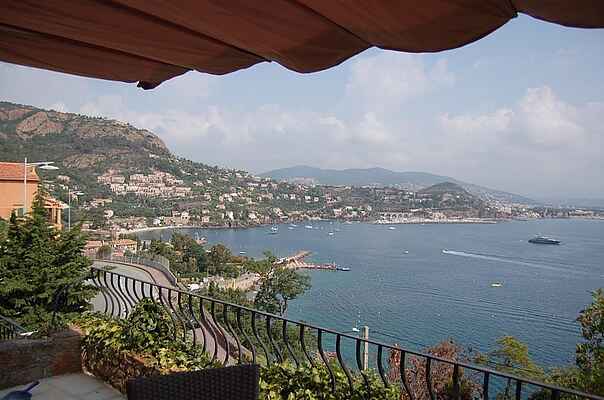 Watersports and the Cote d'Azur are an ideal combination. Who does not possess his own yacht, has numerous possibilities for renting. In combination with the rent of our villa or apartment has the exclusive opportunity with our fast motor boat/cruiser to sail against 50% of the comparable commercial rent. Cost indication = from 350,-euro per day including skipper. Data/motor boat cruiser: Mark Jay Harrington is 280, Volvo/Penta Turbo diesel, length 10 m 300bhp, toilet, shower, kitchen, shop, outsidedinette and bathing plateau.